90% of information transmitted to the brain is visual, which is processed 60,000 times faster in the bran than text. Businesses who market with infographics grow in traffic an average of 12% more than those who don’t. All marketing should be focused on generating leads or sales. Build awareness with advertising, publicity, and networking. Develop a referral program with existing customers. Conduct email campaigns to customers and prospects. Purchase customer lists and use telemarketing qualification to build or improve lists. With an increased digital and social focus in 2014, there are even more opportunities for capturing leads. And you can use that great content from #7 (below) with registration pages to capture leads. Keep in mind 90% of purchases begin with a search! Social media marketing compliments, extends, and enhances your existing marketing efforts. Social media marketing can improve search authority. Social media can be more measurable than traditional marketing. Social media marketing can be more cost efficient than traditional marketing. Beyond marketing, social media can support other critical business functions such as customer service, recruitment, and more. Social media marketing is building a huge body of evidence and case study examples. Learn more in our whitepaper, Social Media Marketing For Beginners. Big social media trends in 2014 include using paid advertising options, customized content, real time marketing, and more. In addition to ongoing SEO efforts and planning, be sure to familiarize yourself with Google Hummingbird – Google’s newest search algorithm focused on semantic search. In combination with an increased focus on semantics, is a decreased focus on keywords in a query. Hummingbird pays more attention to the combination of words and the meaning of the search query as a whole, essentially determining the intent behind the search. “The future is about things, not [keyword] strings” (Matt Cutts). To learn more about Google Hummingbird, including what you can do to stay atop the SERPs read – Google Hummingbird: SEO Questions and Answers. 57% of marketers cite measurement, analysis, and learning as the biggest bottleneck they face (Unica). Start holding yourself accountable and get up close and personal with analytics in 2014. Data from these sources should drive decision-making, not egos or theories. Mobile can no longer be ignored (hopefully you haven’t been). Why? 2/3 of mobile phone owners use their phone to access the Internet and check email. This number has doubled since 2009. And 21% of use mobile as their primary Internet-viewing device (Pew Internet & American Life Project). What this means for marketers is that mobile websites and mobile-friendly emails are now a requirement, not an option. View our Mobile Website Checklist to ensure your website is optimized. 92 percent of companies that blog multiple times a day gain more customers through their blogs. Publishing content transcends just blogging and crosses over into a variety of content including videos, social, case studies, and more. Establish yourself as a thought leader through your content in 2014. Customers don’t want to be sold, they want to be educated. Take leadership with educational content. If your product or service is a business-to-business sale, then case studies, industry surveys and research, training videos and whitepapers are great content types. A blog can be an excellent tool to disseminate your content, while contributing to search engine authority. Interested in learning more about content marketing? 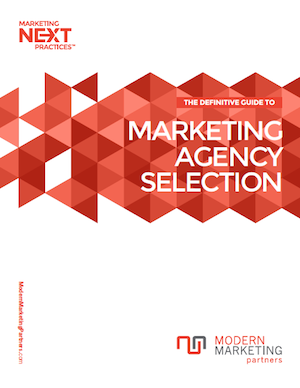 Check out our Guide to B2B Content Marketing. A site more than 3-5 years old could be obsolete! A modern website embodies all that is great about design: a good user experience, easy to follow navigation, visually appealing, and a fast load time. Your website should have arresting visual presentation, provide deep and useful content, and be search optimized for results. In addition to aesthetic improvements, get up close and personal with your website traffic statistics using Google Analytics. How do you rank in search engines for top keywords? Run search engine diagnostics like Moz and Broken Link Checker to identify issues and problems and make these improvements for a successful 2014! Download our SEO Whitepaper for more information. With increased pressure on both sales and marketing departments to do more with less, aligning these departments will be an important task in the New Year. And with an increased digital focus in 2014, the divide could expand even more! Today, 83% of B2B buyers research and make product decisions online (Brafton). Thereby, communicating with the sales team of a company even less! The digital age has created its own set of challenges and opportunities for marketing and sales collaboration. Traditional lead generation tools may be less effective, but digital tools can help bridge the gap: inbound marketing, marketing automation, and social media monitoring. For more details on using these tools, read 3 Ways to Align Marketing & Sales. We saved the most obvious for last. You may think this goes without saying, but you might be surprised how many brands don’t engage in any sort of long-term marketing planning. Larger brands do planning months before a fiscal year. But, even smaller companies should develop and implement a marketing plan. Establish a marketing calendar with events, marketing initiatives, and budgets identified. Identify project plan timing and work backwards to determine action items. Importantly, budget adequately for marketing using 5% of revenue as a reference point. In the age of digital, don’t neglect a social and content marketing plan! Read our whitepaper, Marketing Planning and Budgeting, for tips on preparing and executing an efficient marketing campaign. In the spirit of the holidays, do comment and share this blog with your associates, and happy new year! And for more tips for 2014 read: 8 Marketing Faux Pas To Avoid in 2014.